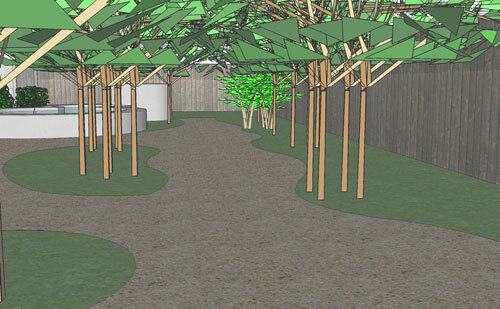 Tis the season for planning construction projects in the garden. The key to a good garden design is getting the major elements designed and decided on early, so you can fill in around them. Much like starting your house renovation with the foundation, so you always have something solid to work from. I'm planning to go around the yard marking off locations of structures this weekend, so we can see if stuff is ending up where we really want it, and be sure that we're not cramming too much in (of course we are). 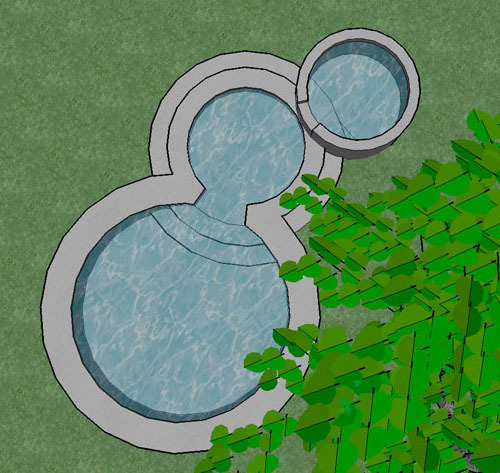 One of the garden features that has drawn a lot of comment and amusement is the dog pond, planned for the back center of the garden. I think the idea of putting so much money into a play feature for the dogs is unthinkable to some, except that the main reason I wanted a pond at all was to indulge my love of goldfish. I just had to accept that any pond I built would end up with dogs in it, so rather than try to fight it I made them their own area so they would leave my fish alone. 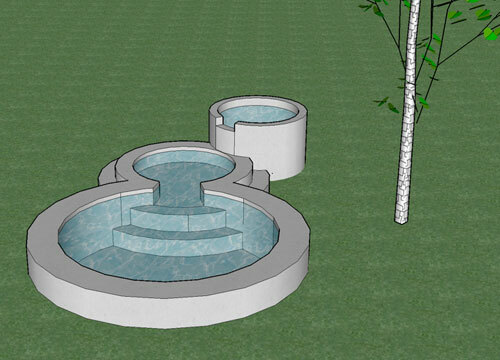 The concept for the dog pond is that there will be three pools: a tall, narrow deep pool for plants that the fish would eat (with no fish in it), and to create a short waterfall that will help oxygenate the water; a shallow, wide pool where the dogs can walk in and soak themselves; and a deeper, wider pool for some water plants and the fish. So far the dogs show no interest in swimming in deep water, but if they wanted to do that, the deeper pool would be where that would happen. I planned stairs in there so that if somebody falls in, they can walk out, and also as a place for setting some plant pots, assuming the fish are relatively mild-mannered about eating some things. Goldfish are not quite as bad as koi about destroying all plant life in their homes, but they are pretty bad. I've just never kept them in a 2,000 gallon pond before, so I don't know if with more space they are better behaved. The fig tree is going to be next to the pond, so I curved the arrangement slightly to accommodate it. Yes, it is true that having a tree right next to the pond -- particularly a tree that drops fruit twice a year -- is less than ideal, but with proper pruning and crop management it should not be too bad and the other option was to simply not be able to fit both of them in in the space we have. The larger fish pond will have a broad edge on it that will be a garden bench, and it faces both the lawn (where the dogs play) and the patio space (where humans socialize). I really like garden seating that is not just a bench, but that is part of the landscape. It's nice to feel like you are sitting on something really substantial, something connected to the earth more than a bench. At least for me. We'd discussed building the pond ourselves, but at this point I think we will hire it out, not just because of the formwork but also because of the amount of concrete required. Also, consider the joys of removing that much concrete from the yard if I tried it myself and totally screwed up. I will probably build the filter myself, because I am very particular (I want a series of vortices that I can drain into the compost for nutrient recapture; the sludge is basically fish manure), but the rest of it can be built by somebody who knows how to do this stuff. I realize that a less formal pond would take less work, but we need the concrete to protect against dog toenails and rambunctiousness. 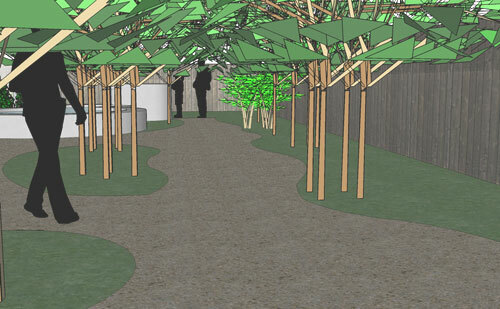 Also, the whole wall-as-bench concept doesn't work as well with a more naturalistic pond. And, frankly, I think a naturalistic pond would look out of place in our yard, as urban and flat as it is. Ponds are not natural formations on the high points of sandy islands. I'm liking the dog pond. I'm sure my dog would like it too. I'll have to take another look at Sketchup. I played with an old Beta and thought it pricey for what it was at the time, but it seems it warrants a second look. I'll probably wait until I upgrade to VectorWorks 12 because it has a Sketchup I/O plugin. Despite my vendors' wishes I still use VectorWorks instead on ACAD. I do all my renderings in LightWave 3D but that's a whole other topic.